It's kind of amazing that Shari Lederman won her case challenging her junk science rating. I mean, junk science is the thing that Bill Gates staked his reputation as a self-appointed expert on. Not only that, but President Barack Obama and his Education Stooge Arne Duncan tied junk science rating to Race to the Top, and forced it down the throats of cash-starved states. I mean, sure, the American Statistical Association says teachers are responsible for 1-14% of student test scores, and sure, we do more than show kids how to pass tests, but when DFER gives all that money to a candidate, they expect results. And they certainly got them, along with Common Core and charter schools and all that other great stuff. The question, really, is why Shari Lederman had to do this on her own dime. I mean, why didn't NYSUT stake her? Why did her husband have to do the whole case pro bono? What about all the other teachers rated by this nonsense who suffered for no reason? I know a teacher who was rated ineffective only because of test scores, but she hasn't got a lawyer for a husband. 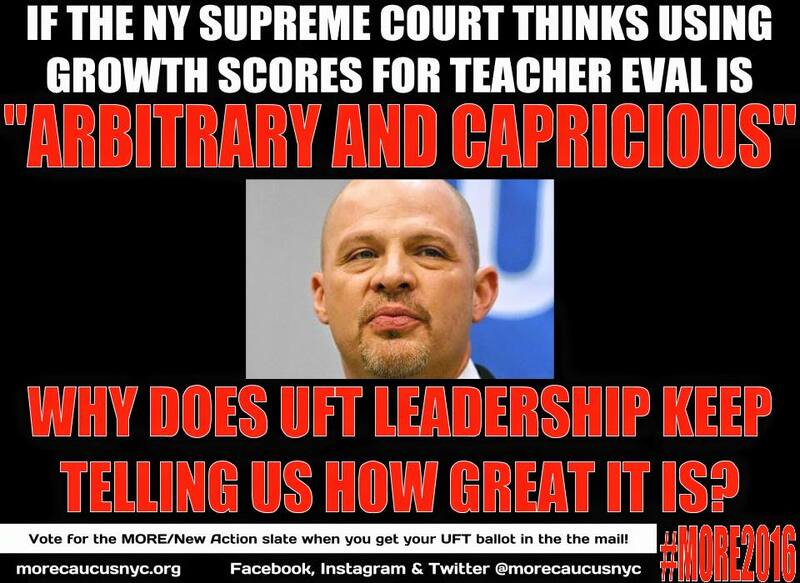 Is NYSUT or UFT going to jump to her aid? Well, not hardly. Michael Mulgrew boasted of having helped write the law that enabled this junk science. Did he really do it? Who knows? And what difference does it really make? He was proud of it. And he still boasts about the 700 teachers who got ineffective ratings last year. I can tell you for a fact that not one of them shares his joy, and that the consequences of this rating are far more severe than that of the unsatisfactory rating. After all, in 70% of the cases, the state no longer has to prove these teachers are incompetent. These teachers have to prove they are not incompetent, and how the hell they do that I have no idea. And even as Mulgrew boasts of how few teachers are being rated ineffective, he thanked Cuomo's Heavy Hearted Assembly for passing a new APPR designed to rate even more teachers ineffective. And what has NYSUT and UFT done to help teachers like Shari Lederman? Nada. Zip. Diddly squat. Why the hell aren't our leaders footing the bills of teachers wishing to challenge these ratings? Well, they have other priorities. The UFT has to pay millions to transfer 800 living rubber stamps to conventions several times a year. I think they're going to Minneapolis this year. I don't suppose they'll have Bill Gates as keynote again, as he lives pretty far away and probably doesn't want to strain himself. 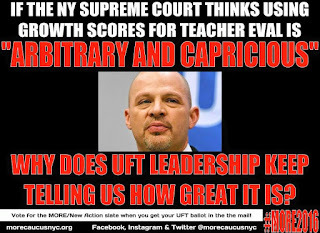 But honestly, why shouldn't UFT get in the business of helping poorly rated teachers lawyer up? I mean, sure they supported junk science, and it was a great victory, but why not oppose junk science and make that a great victory too? I remember well when that mean old Michael Bloomberg wanted to judge us by only 7 components of Danielson but we held out for all 22. I remember the subsequent great victory when we got it reduced to 8. There was the great victory when UFT demanded artifacts, and another when we didn't have them anymore. Then there was the great victory of the UFT transfer plan, and the subsequent great victory when excessed UFT members became ATRs. There was the great victory when we won Common Core, and the great victory when we were suddenly against it and no longer threatening to beat the crap out of those who opposed it. So let's get with the program and get on the right side of things. Most teachers can't afford the prolonged and costly lawsuits it will take to bring sanity to New York State law. Randi Weingarten is praising the Lederman decision. She's the big cheese, right? So let's put our money where her mouth is and back up working teachers. Problem is, at every DA I go to, Mulgrew defends junk science, saying it subtracts from the judgment of principals. But if the judgment of principals is so bad that a crap shoot improves it, the problem is the principals. Let's stop pussyfooting around, lobby for principals who are not insane, and get off the junk science train once and for all.